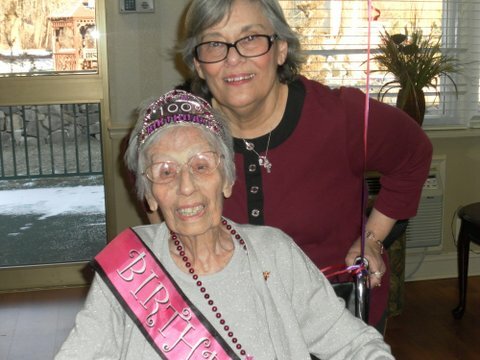 Regency Gardens Nursing & Rehab Resident Celebrates a Milestone! Posted on March 6, 2013	by Judah Gutwein, L.N.H.A. Rosina Pisa – Regency Gardens Centenarian! Rosina “Rose” Pisa, born January 28, 1913 in Jersey City, NJ. 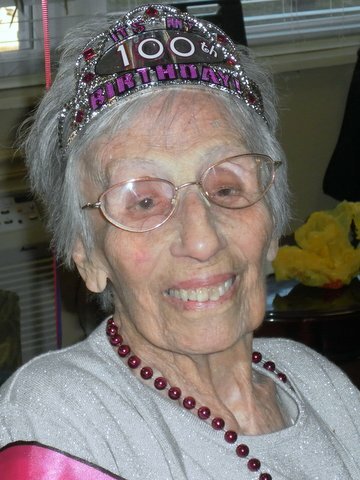 Centenarian, “Cento”, as her large Italian family exclaimed to her in Italian, while they were enjoying her 100th birthday party. Rose was adorned in a tiara and sash, proclaiming this milestone, surrounded by her loving family. Regency Gardens Nursing and Rehabilitation Center, 296 Hamburg Turnpike, Wayne, where Rose currently resides, provided the family of approximately 35 attendees, an exclusive party area for the celebration on Saturday, January 26. The family was looking forward to this day to gather together, and assisted in the planning, decorations and overall excitement of this milestone in Rose’s life, as well as their family’s legacy. Rose was in her glory, with a smile from ear to ear. Loved ones attending to wish her well, and congratulate her on 100 years of life, got a fantastic smile, lots of hugs and an endearing hand wave to everyone. She looked and acted like the beauty queen she is. The family wanted everyone, from children to great grandchildren to participate in the celebration, and appreciate the wisdom, heritage and richness of this vibrant woman. She has twin girls’ great grandchildren that visit her regularly and love to get the hugs she always provides and the set of two year olds were especially excited to see her on her special day. Monday, January 28, 1913, her official birthday, the facility; her extended family, will be celebrating again with a cake, music, and lots of cheer for this special lady. Rose tells all the staff that she loves them on a daily basis, and the staff conveys it is mutual and easy to love this diminutive, sweet lady. She is very content, and expresses to her daughter how beautiful it is at Regency Gardens. Her daughter, Virginia is very grateful for the staff and states she is always well cared for in every aspect and she has an excellent quality of life. Rose did reside with her daughter and son-in-law for many years. Rose needed extra care, about two years ago, and the decision was made to move Rose to Regency Gardens Nursing and Rehabilitation Center after much research by the family. The decision was made to reside at Regency, based on the fact of how very caring and competent the staff was. Regency Gardens is a 120 bed, home like facility that provides short term rehabilitation, as well as long term care, in a warm, inviting, caring environment. Rose was very physically active well into her 90’s. She did not drive, and walked everywhere, and loved to dance. She would walk to all her activities and shopping in the town of Lyndhurst, where she resided with Virginia. Virginia conveys, even if someone offered her a ride, she would walk. Through her hundred years, her family expresses she has had endured many ups and downs in life, but always remained strong and positive. Her family visits on almost a daily basis, enjoying meals, activities, and appreciating the comfort of each other’s company. Rose delights in singing the Italian songs, and has lots of friends and staff that join in with her, enjoying the frequent live entertainment provided by the facility. She enjoys playing bingo, and interacts in the recreation and activities that take place on a daily basis at Regency Gardens. Regency Centers, also has locations in Dover, Hazlet and Somerset, and actually is home cumulatively to a dozen centenarians. To celebrate, and honor Regency centenarians, along with all other hundred year celebrants that would like to attend, Regency Jewish Heritage, 380 DeMott Lane, Somerset, will be hosting a Centenarian luncheon, on May 19, 2013. This celebration invites any and all centenarians that want to join in this special occasion. The event will be a Guinness Book of World Records Opportunity, for the Record of the “Largest Gathering of Centenarians”. Last year, Regency Jewish Heritage hosted a luncheon, wherein 22 centenarians attended, and was a wonderful event. All of the attendees were featured in the newspaper, and was an amazing moment for them to be featured. This year, we would like to have the attendees and their families enjoy a fantastic opportunity to become part of a legacy and make a “new memory” for new generations to enjoy the rich history of their family, and their centenarian in their life. While Rose has her big family to celebrate with and love her, she also has the addition of the Regency family that love her, and she has become a special part of the Regency family. Everyone wishes Rose another “Cento”, and keep that beautiful smile for all to behold. Rose with her daughter, Virginia exuding that fantastic smile and pure joy. For further information on the Centenarian celebration, contact, Marie Barnes at 732-739-5994, or email, mbarnes@regencynursing.com. For further information about Regency Gardens, call 973-790-5800, or visit www.regencynursing.com. This entry was posted in Regency Resident Spotlight and tagged regency gardens, regency gardens in wayne nj, regency gardens nursing and rehab, regency gardens wayne new jersey, regency nursing home in nj, regency nursing home in wayne nj. Bookmark the permalink.